In his professional role managing a diverse, and often remote team, Barry is ideally experienced to provide practical examples to students regarding human resources and cross-cultural management principles. Barry has returned to Prague College to deliver guest lectures on managing global teams and cultural awareness to our students on both the undergraduate & postgraduate business programmes. 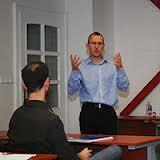 Barry graduated from the MSc International Management programme with a Distinction, the highest grade possible. He completed the programme while continuing to work for Honeywell.